COLUMBUS, OH--(Marketwired - April 07, 2016) - Macola, a leading provider of ERP and business software, today unveiled details of its corporate social responsibility and community service programs to fight hunger issues locally and across the Americas. Since 2015 the company has provided financial support, volunteerism and product donations to food banks across the country to help them streamline operations and better serve their communities. This year, Macola is participating in the Empty Bowls Project, an international grassroots effort to raise both money and awareness in the fight to end hunger. Additionally, Macola has continued its Macola Fights Hunger initiative in Central Ohio, which encourages employees, friends and family to donate to Mid-Ohio Foodbank -- on behalf of the company. According to Yolanda Owens at the Mid-Ohio Foodbank, a donation of as little as $25 can provide at least 100 meals for a single person. "Our employees, partners and customers are passionate about fighting hunger in the Americas," said Alison Forsythe, managing director, Macola. "For that reason, we have galvanized our resources with corporate philanthropy and employee volunteerism to support various programs that reflect this commitment." At Macola's leadership meeting earlier this year, the team kicked off its participation in the Empty Bowls Project by painting bowls to auction off at various events throughout the year. The organization's largest auction will be at Macola's annual customer conference, Exact Macola Evolve, taking place April 19-22 in Atlanta, GA, with all proceeds going to the Atlanta Community Food Bank. Exact Macola Evolve 2016 will focus on trends and disruptions in the manufacturing and distribution markets, aims to provide attendees -- C-level executives, consultants, business management, IT professionals and daily users of Exact Macola solutions -- with new tools and ideas to accelerate company growth, transform their businesses and positively impact bottom lines. 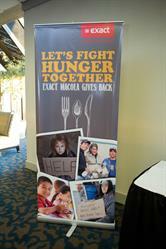 To learn more about Macola's community service efforts or to donate to the Macola Fights Hunger initiative, visit www.exactmacola.com/about-exact-macola/community-service. For more details on Exact Macola Evolve 2016 or to register to attend, please visit www.exactmacolaevolve.com. Vigorous business software. That's what Exact builds. For more than 250,000 businesses around the world. For entrepreneurial doers who dare and, if they fall, always get up again. Exact breathes that same spirit. Thirty years ago a garage start-up by six students, now a global company, employing 1,550 people in 15 countries with revenues of EUR207 million in 2015. With Exact, businesses can quickly respond to shifting market conditions and grasp opportunities with both hands when they arise. Our business software enables customers to focus on their next goal, and look ahead to the next challenge. For further information about Exact, visit www.exact.com and www.exactmacola.com.